The Ryukyu flying fox utilizes forest for daytime roosting. It eats the fruits of a variety of plant species. Figs are a favorite. It lives in colonies. Threats apparently include hunting and deforestation on different islands. 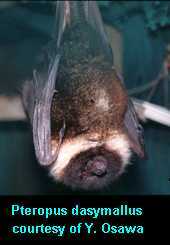 *** The Ryukyu flying fox can be a pest of commercial fruit crops. The Ryukyu flying fox utilizes forest for daytime roosting. The Ryukyu flying fox lives in both the Japan and the Philippines Biodiversity Hotspots (Cons. Intl. 2005). 1 birth of a captive animal in May has been recorded. The Ryukyu flying fox eats the fruits of a variety of plant species. Figs are a favorite. The Ryukyu flying fox lives in colonies.